Unwrap the cup, boil water, pour it into the cup, and wait for the broth and noodles to cool down. That’s the process that most American college kids have been using since the 1970s to make a cheap, tasty meal. In a new twist, New York City students are choosing to slurp up their ramen in the dimly lit, upscale restaurants with $20 ramen as high-end meal on their menus. With the highest concentration of Japanese Michelin-starred spots outside of Japan, New York—from Flatbush to Flushing – has become a hub for ramen cuisine, a rapidly growing ethnic-food craze becoming the go-to, go-out meal for college students. Ramen noodles, which were once confined to supermarkets and kitchen pantries have made their way onto many of the menus of the estimated 9000 Japanese restaurants in the United States. New York City now has a large “ramen belt,” as it has been nicknamed by New York Times restaurant critic Pete Wells, which stretches from Fort Lee, New Jersey, across Manhattan, to Brooklyn and Queens. The shift from instant snack to sit-down meal correlates with the success of Japanese foods in general, with sushi also now both a gourmet and take-out food. One reason for the popularity is that both ramen and sushi contain less sugar, less fat, and fewer calories than traditional American foods, according to Japan’s External Trade Organization. The run on ramen also has been stoked by social media. “It’s just a trend that young, NYU people, who also see it as the perfect Instagrammable food, want to jump on board,” Alexander said. Brian Macduckston, cookbook author and creator of the blog Ramen Adventures, which documents his journey eating at the best ramen restaurants in Japan, eats anywhere between five and ten bowls of ramen per week. During his time traveling and noodle-tasting, he has noticed that some of Japan’s “most prolific ramen eaters” are college students. 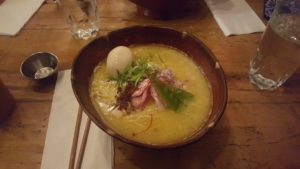 “So many people I have spoken with remember eating ramen as a child, and as a young adult they can really eat as much as they want due to the price,” he says, which he also thinks parallels with its appeal to American students. “Ramen is still an affordable food, even at restaurants. I think with the rise in popularity of casual gourmet food, ramen is poised as a real contender.” Great source! The global instant noodles market is projected to reach 126.8 billion packs by 2022, according to a report by Global Industry Analytics, Inc. So, it is unlikely that all college kids will leave the dry noodle packets behind completely; but, as the demand for instant noodles continues to grow, students at city schools like NYU will most likely push the upscale ramen scene to follow the same path of popularity.